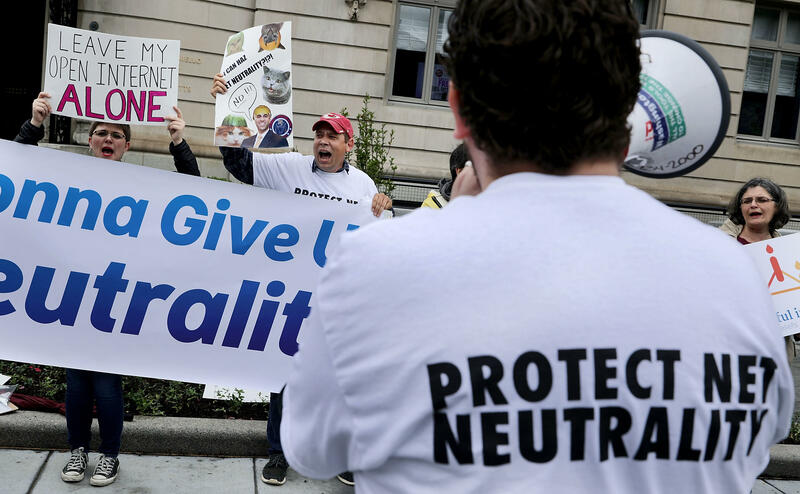 Twenty-two state attorneys general and the District of Columbia have asked a U.S. appeals court to reinstate net neutrality rules that barred internet providers from throttling traffic or offering paid fast lanes. The group, led by New York Attorney General Barbara Underwood, originally filed suit in January after the FCC voted in December to roll back the Obama-era policy. They state in a new brief filed Tuesday that a "free and open internet is critical to our democracy." "By repealing net neutrality, the FCC is allowing internet service providers to put their profits before consumers while controlling what we see, do, and say online," Underwood wrote. The brief argues that the "FCC's order is arbitrary and capricious because it puts consumers at risk of abusive practices by broadband providers, jeopardizes public safety" and that it "unlawfully purports to preempt state and local regulation of broadband service." "For more than fifteen years, the Federal Communications Commission has agreed that an open Internet free from blocking, throttling, or other interference by service providers is critical to ensure that all Americans have access to the advanced telecommunications services that have become essential for daily life. The recent Order represents a dramatic and unjustified departure from this long-standing commitment," the brief states. The coalition of 23 Attorneys General collectively represents over 165 million people and includes the Attorneys General of New York, California, Connecticut, Delaware, Hawaii, Illinois, Iowa, Kentucky, Maine, Maryland, Massachusetts, Minnesota, Mississippi, New Mexico, New Jersey, North Carolina, Oregon, Pennsylvania, Rhode Island, Vermont, Virginia, Washington, and the District of Columbia. In June, the Federal Communications Commission (FCC) put into effect a new rule, "Restoring Internet Freedom," to replace regulation that ensured internet providers treated all websites and content equally. FCC chairman Ajit Pai defended his agency's policy shift on "CBS This Morning" in June, saying that the new rules will provide a "light touch approach" that produces "tremendously positive" benefits for consumers.